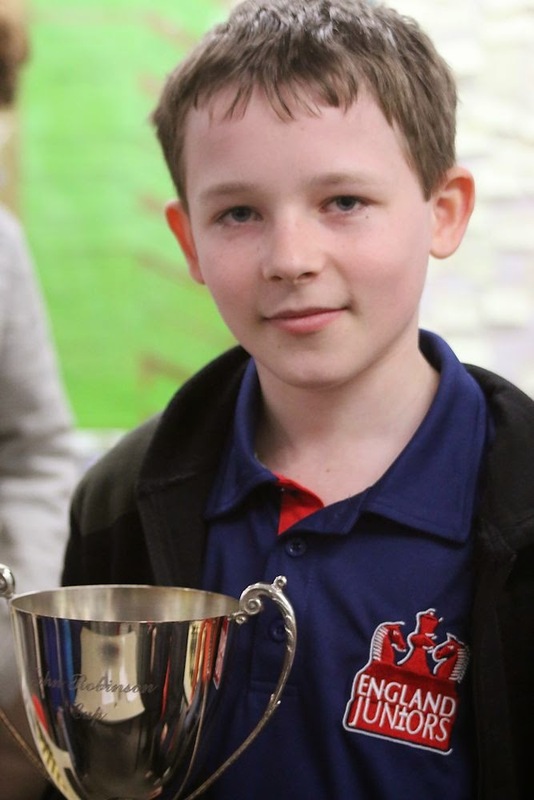 Back in August last year, Alex Sheerin was a member of the six-board England team that won the John Robinson Cup, in the quadrangular Under 14 match held at the University of Stirling, against similar teams from Scotland, Ireland and Wales. He was recently given the trophy to hold, each team member having a couple of months to share it. The photo (left) was taken today at the Bury Knights Junior Club, where Alex (ECF 128) finished in third place to Anita Somton (138) and William Sait (127) after the seventh and final round of the Delancey UK Schools Chess Challenge. Anita won all seven games in the competition, whilst William lost only to Anita.